Memorial day weekend always kicks off the summer season for us. It may not actually be summer yet, but it definitely feels like it! Bring on the backyard parties, pool time and the 4th of July. 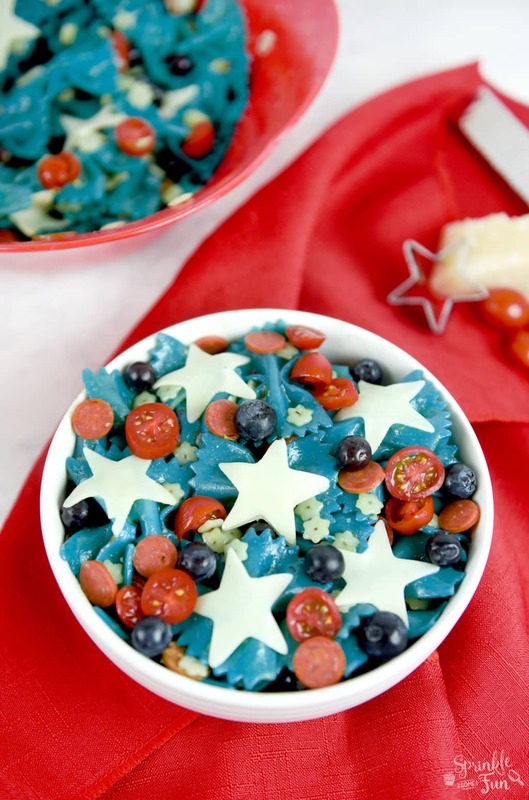 I made this Patriotic pasta salad the other day for Memorial day and my family ate it up. We love the tangy balsamic vinaigrette with the pasta salad mixture. This would make a great dish for any summer holiday and especially for the 4th of July. 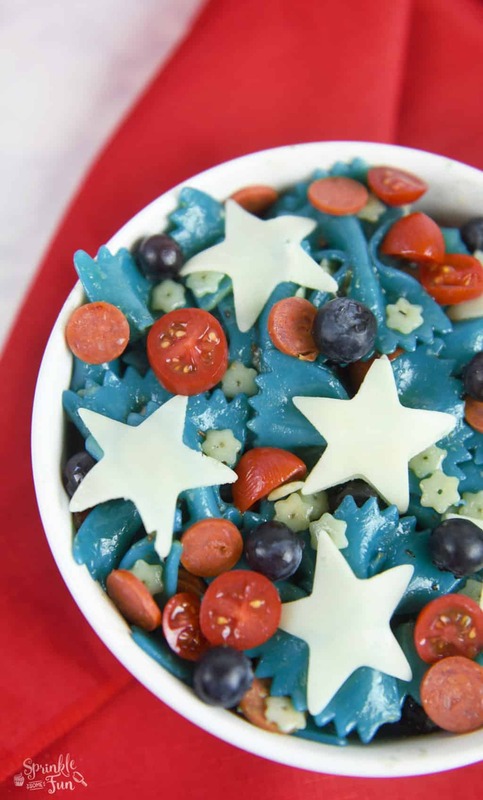 Aren’t those cheese stars and blue pasta noodles the best? We loved it and it turned out so festive. 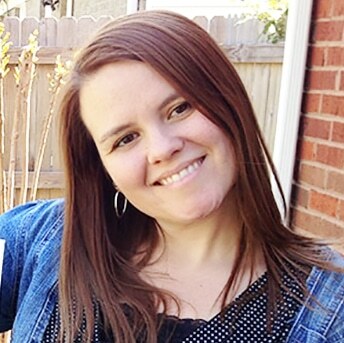 I am including a few affiliate links in this post so that you can find the exact ingredients and tools I used to make this. I tried to keep everything within the red, white and blue theme. It was especially hard when I started thinking of things to eat that were blue. Pretty much blueberries (which are really indigo purple) and that’s it! I knew that I needed to color something blue and that’s when I made the pasta blue. I just dropped in around 15 drops of blue food coloring into the boiling water as the pasta cooked. Then I rinsed off the pasta and put it into a gallon sized plastic bag with 2 Tbsp. water and around 20 drops of food coloring. I shook it around and let it rest on the counter while I got the rest of the pasta salad together. When I was ready to add the blue pasta I rinsed it off one more time and drained it. I love the result! 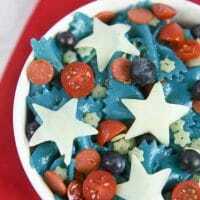 What a fun patriotic pasta salad recipe! Mix the two pastas together first in a large bowl. Mix the balsamic vinaigrette with the salt, garlic and grated parmesan and then pour the mixture over the 2 pastas. Add the rest of the ingredients except for 5-7 of the mozzarella stars and then mix. 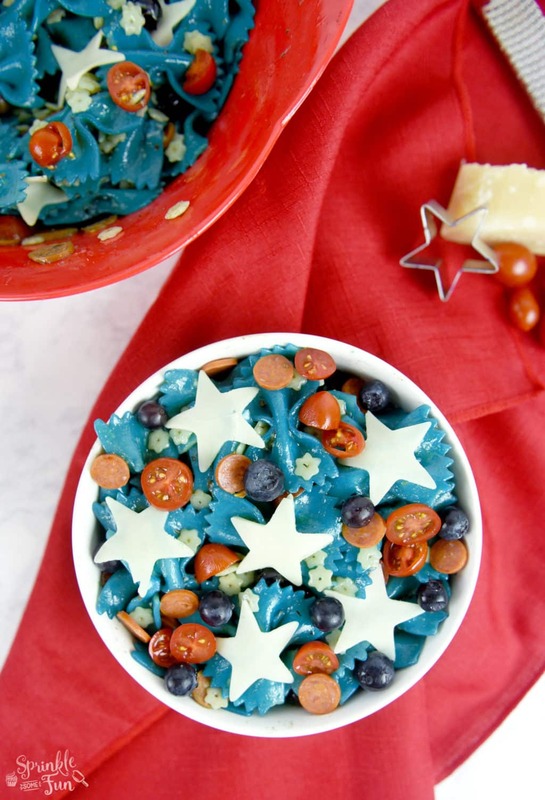 Add the leftover stars to the top of the salad for added decoration. 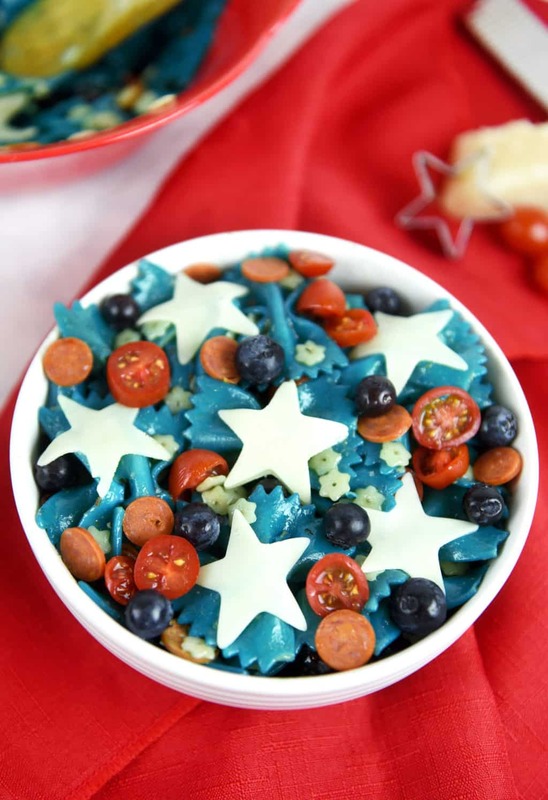 I stumbled upon this on Pinterest….and this has to be the coolest looking pasta salad ever. Such an awesome idea to dye the pasta!